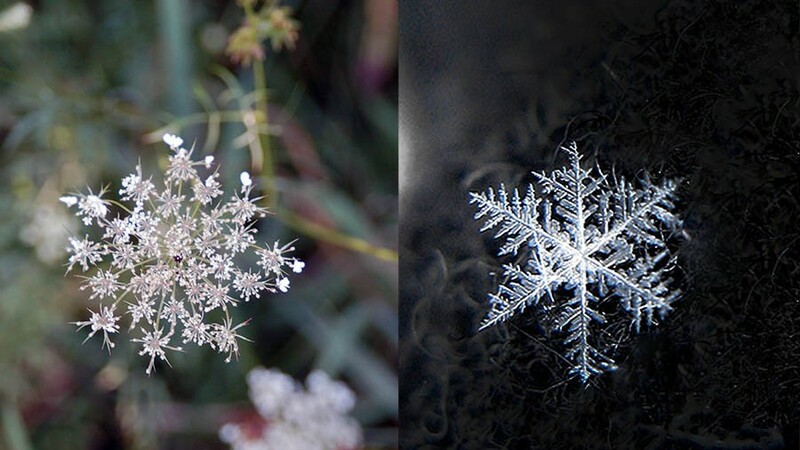 This Queen Anne’s Lace (Wild Carrot) reminds me of a snowflake. In my previous post I mentioned that Nature, family and music are often the source of my inspiration. These sources of inspiration are triggered by a specific moment, a memory or a feeling. For example, the sweet smell of pine trees on a dewy morning, or a family of Mallards rhythmically floating on the lake. Or the shadows that trees cast on the ground. Or mismatched buttons on a person’s coat. I think you get the picture… One such spark of inspiration is a memory of my mother whom was taking extra biology courses to upgrade her skills in health care. I was young at the time, maybe 11 but it was something that made an impression on me. She had a series of medical and science textbooks and I remember spending hours repeatedly looking through them, studying each illustration in careful detail. One day my mother pointed to a plant cell diagram in one of her textbooks and asked if I could draw one like it in her notebook. Thinking as children do at that time, it never occurred to me to simply trace the illustration into the notebook (now thinking back it would’ve saved a lot of time!). However, I studied the illustration and carefully drew every detail neatly into her notebook. I was quite proud of that first diagram when completed. I can only guess my mother thought I did a good job. She didn’t say so directly, but I drew several more illustrations for her thereafter, mostly of various plant and animal cells, but also of organs, skeletal and muscular structures. Why am I sharing this story? Well it was that moment, that memory that I discovered my interests in not only the organism itself but the commonalities shared across all living things. Over the years, I’ve learned all living things share common patterns expressed visually or rhythmically. The patterns are found repeatedly in not only organisms but in other forms such as sound waves, sine waves, and electromagnetic fields etc. Some people may refer to these repeating patterns as Fractals. A Fractal is a never-ending pattern that repeats itself at different scales – a fascinating subject on its own and warrants a separate discussion. However if you’re interested in learning more about Fractals here is a good place to start, but there are plenty of other resources on the web. 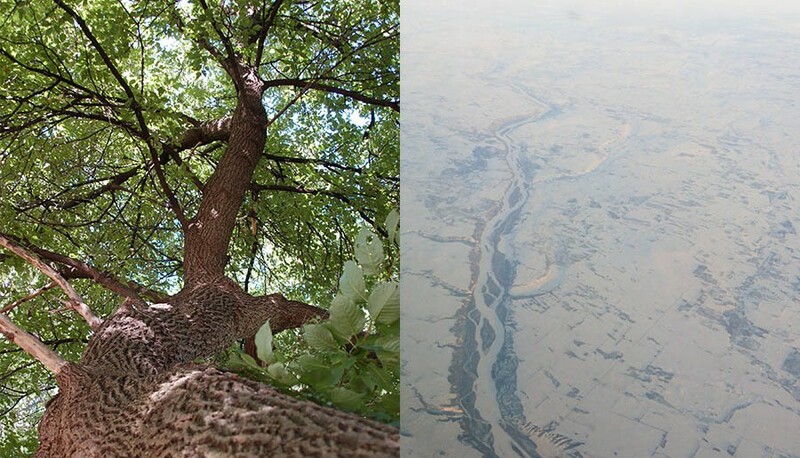 What I’m interested in are the natural patterns found in living things and the commonalities that connects us all. My inspirations lie in identifying and expressing elements of these patterns through my artwork. For example in my Sanctum or Organics series, certain lines that repeat mimic the movements of water, wind or a wave in a person’s hair. Whereas the shapes may represent patterns seen in flowers or pine combs. These elements expressed in my paintings are the patterns seen across all life and bind all. Seemingly separate on the surface, all things live and move together as one – Like a field of sunflowers swaying in the wind. The things that connect us are my inspiration and serve as the underpinnings for my work. 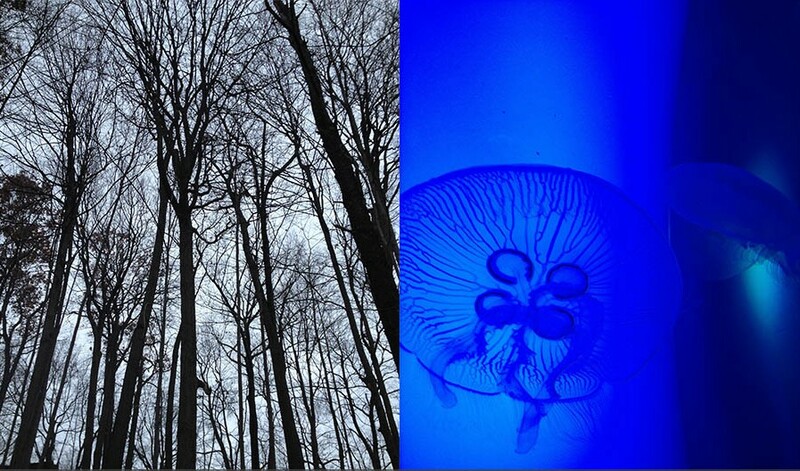 Growth patterns in the branches of the might Red Oak trees are similar to the patterns in the tentacles of the Moon jellyfish. Looking up above and down below there are natural pattern formations.